374 pages | 2 B/W Illus. 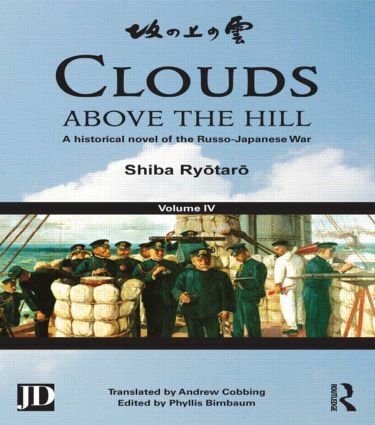 Clouds above the Hill is the best-selling novel ever in Japan, and is now translated into English for the first time. An epic portrait of Japan in crisis, it combines graphic military history and highly readable fiction to depict an aspiring nation modernizing at breakneck speed. Best-selling author Shiba Ryōtarō devoted an entire decade of his life to this extraordinary blockbuster, which features Japan's emerging onto the world stage by the early years of the 20th century. Volume IV begins with the dramatic battle of Mukden where Akiyama Yoshifuru’s cavalry play a major part in the action against the Cossacks. Meanwhile, Admiral Tōgō’s fleet sail to the Tsushima strait to intercept the Baltic Fleet en route to Vladivostok. With the help of Akiyama Saneyuki’s strategies, the Baltic Fleet is totally destroyed and the Japanese fleet make a triumphant return to Yokohama. Anyone curious as to how the "tiny, rising nation of Japan" was able to fight so fiercely for its survival should look no further. Clouds above the Hill is an exciting, human portrait of a modernizing nation that goes to war and thereby stakes its very existence on a desperate bid for glory in East Asia. Shiba Ryotaro (1923-1996) is one of Japan's best-known writers, famous for his direct tone and unfliching depictions of war. He was drafted into the Japanese Army, served in the Second World War and subsequently worked for the newspaper Sankei Shimbun. He is most famous for his numerous works of historical fiction.